Will Holman and Tim Pike. The openness of the UK economy — measured by international trade and labour flows — has increased substantially in the past twenty years (Charts 1 (a) and (b)). In this post we explore three structural changes to the economy arising from globalisation that we have observed daily in our visits to companies around the UK. These are increases in: (a) openness of product markets; (b) access for UK businesses to overseas labour; and (c) outsourcing of non-core activities to lower-wage economies. There is a long-running debate whether globalisation of markets has weakened the link between domestic factors, such as the amount of domestic slack (spare capacity among UK-based firms and workers), and inflationary pressures. In our view, these structural changes have provided an additional source of slack in product and labour markets that has borne down on UK inflation in recent years. Looking to the future, the vote on 23rd June to leave the EU might affect the pace of change of these forces, making future trends uncertain. The UK has not been alone in seeing significant increases in trade flows over the past couple of decades (Chart 1a). These trends have been spurred by investments in productive capacity in emerging markets, especially the Far East, and in infrastructure that supports trade, particularly communications and containerised shipping. The trend extends to services too, for example in the long-term growth of overseas tourism and international trade in financial services. More recently, growth in the UK’s import share of total spending volumes has slowed since the financial crisis of 2008-09, perhaps in part due to sterling’s large fall at that point. And growth in world trade has slowed since 2010, turning negative in 2016 Q1 and Q2 (see the CPB World Trade Monitor). Nevertheless, it is clear from our conversations with businesses that they face intense and enduring international competition. Manufacturers of tradable products — for example food, household goods and chemicals — are aware of the latent threat of competition from imports. Raising prices too far encourages distributors and retailers to shift to foreign from domestically-manufactured goods. This pressure has risen as the internet has increased price transparency, and been particularly acute since the financial crisis: businesses often tell us that households have become more price-conscious. Globalisation of product markets is a well-recognised and long-established trend. A more recent phase of globalisation, and one that is still growing rapidly, is greater openness in the supply of labour (Chart 1b). Both have attracted the attention of monetary policymakers in the UK and US, and elsewhere. A key part of our job within the Bank’s agency network is speaking to company owners and directors about the conditions and issues facing their businesses. From this perspective, a recurring theme has been the growing dependence of many companies on the ready availability of workers from abroad. There has been clear growth in migrant labour across most types of job – as illustrated by Nickell & Saleheen (see their Figure 5 in particular), who also note that in recent years there has been “a greater abundance of immigration in low skilled jobs, particularly from EU countries”. Growth of jobs in predominantly low-paying industries — such as residential care, hospitality, leisure, cleaning and food processing, which in total account for about one third of all jobs in the economy — has been comparatively strong since 2008. (See for example Figure 1.7 and Table 1.9 of the Low Pay Commission Spring 2016 Report.) These industries have relatively low levels of labour productivity, and rapid output growth has needed an abundant supply of willing workers, often satisfied from the pool of migrant labour (see Table 1 of a recent Resolution Foundation report). In consequence, there has been a compositional change in the employed labour force that has reduced measured average wages and productivity in the economy. The expansion of the available labour pool to beyond the UK’s borders also extends to the process of offshoring work to be carried out abroad, either by directly-employed staff or through outsourcing specialists. Offshoring has been most obvious in manufacturing, but has extended into services in recent years — and it is in services where offshoring is now having the greatest impact. Cost. Labour costs in Eastern Europe and South Asia — key destinations for offshoring — are considerably lower than in the UK. This is a major factor in, for example, offshoring back-office processing and customer contact functions. Skills shortages. The UK suffers from shortages of certain skills, particularly in IT, where labour demand has grown very quickly. Specialist firms abroad are able to provide a relatively plentiful and stable supply of workers with relevant skills. Proximity to final market. In some cases, UK firms are moving production, sales and after-sales service roles abroad in order to be closer to end customers. Language and technology as enablers. UK companies are particularly well placed to offshore labour due to the widespread use of English as a second language. In addition, technologies such as fast broadband, cloud computing and video calls have helped firms manage staff, projects and workflow at a distance. Offshoring presents management challenges and risks adverse client reactions, and does not always succeed. But usually firms have continued to offshore while mitigating the risks — for example moving only back-office processing work. So the trend of increased outsourcing is likely to continue, particularly when UK labour markets are tight. What does this mean for the relationship between slack and inflation? Due to greater openness in product markets, UK firms may be limited in their ability to raise prices, even when operating at high levels of capacity utilisation — except to respond to common shocks across the economy, e.g. hikes in commodity prices or a fall in the exchange rate. Due to greater openness in labour markets, employers have less need to offer higher wages in order to attract new recruits: when faced with a situation of excess labour demand, the supply of labour has responded quickly, without necessarily any increase in wage inflation. Even sectors which struggle to recruit workers, such as domestic care and food processing, have filled labour vacancies without significantly increasing pay rates. This fresh supply of labour positioned outside the UK is not captured in standard measures of labour market slack. 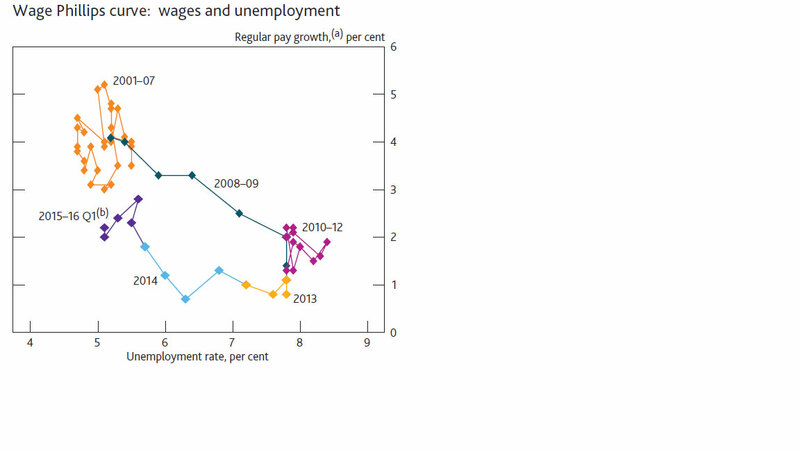 Moreover, the compositional shift in the labour force towards lower productivity jobs, which has occurred over the past decade, has (temporarily) reduced wage inflation for given rates of unemployment. It is unlikely though to have lowered price inflation, because lower wage and productivity growth have broadly equal and offsetting effects on the growth of unit labour costs. The growing opportunities to outsource work have similar effects to the ready supply of migrant labour — providing businesses with outside options and limiting domestic wage growth. Chart 2 illustrates the extent to which wage inflation has been comparatively low in recent years for given rates of unemployment. For example, over the past year or so, wage inflation has been around 2-3%, while the unemployment rate has varied between 5-6%. That is in marked contrast to the period 2001-07, when wage inflation was higher at between 3-5% with broadly comparable rates of unemployment. The developments associated with globalisation reflected in our conversations may go some way to explaining the relative weakness in wage growth seen recently. (a) Whole-economy total pay excluding bonuses and arrears of pay. Percentage change on a year earlier. (b) 2016 Q1 shows data for the three months to February. Chart 2 first appeared as Chart 3.1 in the MPC’s May 2016 Inflation Report. The UK has progressively become a more open economy, first in its product markets and latterly in its labour markets and in offshoring practices. On the basis of our conversations, we believe that the changes we have set out in this article have important implications for monetary policy, because slack in UK labour and product markets may be greater than has been estimated. In consequence, wage and price inflation may continue to be lower than expected, and thus monetary policy may need to be more accommodative to keep inflation close to target. The UK electorate’s vote to leave the EU might affect the future flow, and composition, of net migration, as well as the import share of spending volumes and the attractiveness and ease of outsourcing. The consequences of increased globalisation also extend well beyond those we’ve discussed. For example, its effect on economic inequality — particularly due to weak wage growth for lower-skilled jobs — is the subject of much lively debate. The globalised nature of modern business raises important questions for monetary policy and for wider society. Will Holman is the Deputy Agent for the Yorkshire and the Humber region and Tim Pike is the Deputy Agent for the South East and East Anglia region. If you want to get in touch, please email us at bankunderground@bankofengland.co.uk. You are also welcome to leave a comment below. Comments are moderated and will not appear until they have been approved. Bank Underground is a blog for Bank of England staff to share views that challenge – or support – prevailing policy orthodoxies. The views expressed here are those of the authors, and are not necessarily those of the Bank of England, or its policy committees. This is very interesting, inviting a broad policy interpretation that might be tendentious: that globalisation – insofar as discussed here in relation to product markets, labour markets, outsourcing/offshoring – is behind deflation. Maybe not only in UK but more widely (in developed countries, bearing in mind that the impacts must vary for those regions and countries that are swing suppliers of cheap labour etc). So, whilst they used to say that you can’t fight the Fed, it may be that governments have been doing so, via international economic liberalism. If that is what has been going on for a few decades, then what use unconventional monetary policies (other than to compete at the margins over international distribution of deflation)? Governments, whilst having made central banking independent, may also have created conditions in which it is impotent. That could apply not only to the current deflationary situation but also to the pre-2008 situation, in which low inflation was credited to monetary policies of the time. The prospects for the UK in the context of Brexit are indeed worth a moment’s thought. This article brings forward, for me, one of my central concerns about globalization – in other words, the benefits of globalization (lower costs of production through lower wages and input costs, resulting in lower inflation and greater access to goods) to unskilled or, in the case of manufacturing, even skilled workers, who are displaced from jobs outsourced to other countries and workers, are in many ways outweighed by the negatives (fewer employment opportunities, lower wages at home and, in many cases, poorer quality goods and services). There are always winners and losers when there are significant changes within economies, and this has happened throughout history, but I cannot help but think that we missed the boat, and are still missing the boat, when it comes to globalization, particularly relating to this issue. Businesses (and their shareholders) who can benefit from outsourcing/offshoring have been given a tremendous gift through liberalized trade, a gift in many ways paid for by those most negatively affected by the trend to liberalization. This should not have been allowed to happen without ensuring those most negatively affected are also ensured access to some of the benefits from the process through increased expenditures on education, training and social programs. For these people, cheaper and a greater variety of goods and services appear to be roughly equal to lower wages and fewer opportunities for employment. Unfortunately, western governments mostly just give lip-service to the need to re-train, educate and support those displaced because the measurement used throughout the world to determine progress and success is growth and growth alone, assuming growth will benefit all, when in many cases it does not. Also, when you allow free access to markets and many of these competing markets do not have the social safety nets we have in the western world, and do not care to put them in place, we have a race to the lowest common denominator when it comes to support of those most negatively affected by the process of liberalization.